Last Christmas Eve, I was finishing up my cards and I headed to the local dollar store so I could pick up some supplies to complete them. When I walked in, I was surprised at how many people were doing last minute buying before the stores would close for the next day. I was not in a huge rush so I walked around the store. I was perusing their small gadgets when I overheard a conversation. A young boy walked by and passed another girl with her mom. The kids exchanged glances and waved when they realized who each other were. "I know your face!" exclaimed the boy. His mom was close by and asked him, "Who is she? What is her name?" Thinking for a second, the boy looked at the girl and back at his mom and said without hesitation "I dunno!" It is pretty hilarious to sometimes recognize people or things, but completely blank on their name. If I were ever in that situation, I probably would have avoided the other person until I knew their name, haha. For products, it can be a good or bad thing depending on how much or little they remember about the product. If a similar looking item can generate brand recognition, it can be a positive thing. However, if they do not remember or it brings up bad connotations, it may be time to switch their image. With the Fractal Design Define S2 arriving, I definitely made several takes, especially with how similar it looked to past Fractal Design cases. This manufacturer is known for its quality cases through their lineup, so does this keep up with this reputation inside and out? Let us read on to find out! 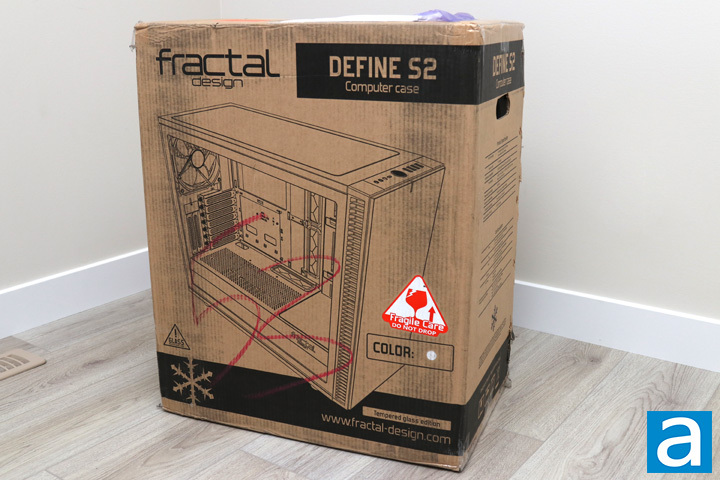 Today's review unit of the Fractal Design Define S2 arrived from the company's offices in Dallas, Texas, USA. As with other Fractal Design products we have received, the Define S2 arrived with FedEx and their international ground service. The box arrived in relatively good condition, though you can see how faded one panel is compared to the rest of the box. Otherwise, there are no real dents or bruises to be too concerned about. As this box is relatively huge, it is unsurprising to see the retail container as the shipping box. The retail box design for the Define S2 is pretty similar to the last Define S, as well as practically every recent Fractal Design case we have reviewed. This company generally keeps their retail boxes simple, with a black outline of the case on the front panel. Some specifications can be found on the side panels and other places. Fractal Design's branding can be found on the edges. The white color variant of the Define S2 is displayed on the box, but there are other colors available for this model, including Black, Blackout, and Gunmetal. 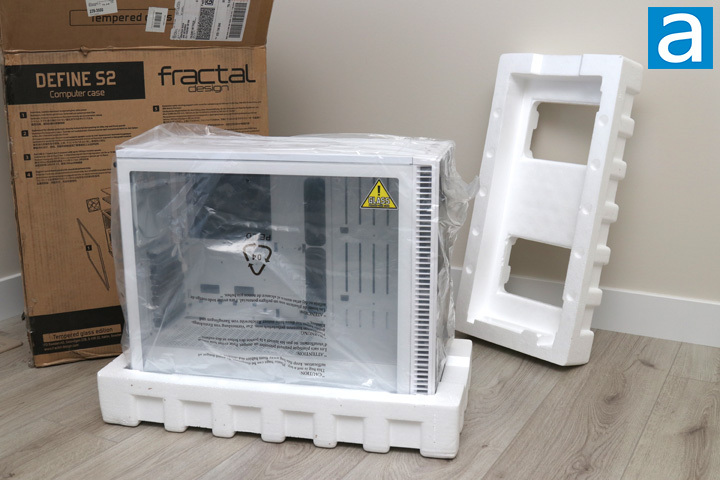 Out of the box, you can see Fractal Design has packaged the whole unit quite well. A clear plastic bag surrounds the whole case with two large white foam brackets fitted on the top and bottom of the case. The thick foam brackets should do a sufficient job in protecting the case during any shipping accidents. Plastic sheets cover both sides of the tempered glass panel to also prevent any surface damage the glass may face in shipment. Otherwise, a separate bag holding the user manual and warranty information is packed outside the case. posted 2 hours and 30 minutes ago, with 4 posts. posted 7 hours and 58 minutes ago, with 4 posts. posted 15 hours and 13 minutes ago, with 12 posts. posted 15 hours and 18 minutes ago, with 56 posts. posted 15 hours and 18 minutes ago, with 11 posts.